Cold Moon Press is excited to announce guidelines for the first volume of their annual anthology, Walking Down the Sky. This antho will focus on the full moon as viewed by other cultures, such as the Cold Moon in December (or January, depending which culture you explore). What would happen in your story during Hungry Ghost Moon? Who would your main character meet during the Moon of Winds? (If you need help getting started, use your search engine to find “full moon names,” and you’ll find plenty of ideas!). Poetry and art submissions should also incorporate this theme. We want stories for each month of the year, and one bonus story, for a total of 13 titles. We prefer urban fantasy, fantasy, science fiction, and horror. While the tone of this anthology is dark (and we are ok with not-so-happy endings), we are trying to keep this rated PG-13. Click here for more details and submission contact information. C.A. Kunze Interviews Me for the July Blog Hop! For most people, an experience with social networking helps them connect with new acquaintances and bridge the gap between long-lost friends. But one man has adopted its resources to fulfill a more sinister agenda. Brandon Thornley uses the database to search for potential victims as he feeds his thirst for blood. What Brandon doesn’t realize is that someone has accepted his request…and this person is even more ruthless than him. New Haven Police Detective Patrick Morgan is assigned to investigate a string of ritualistic murders, which leads him to discover that the killer has left behind something valuable.Armed with the evidence he needs to bring a madman to justice, Detective Morgan sets his sights on his target. Unfortunately for him, he’s not the only one, and his competition will do anything to ensure he fails. 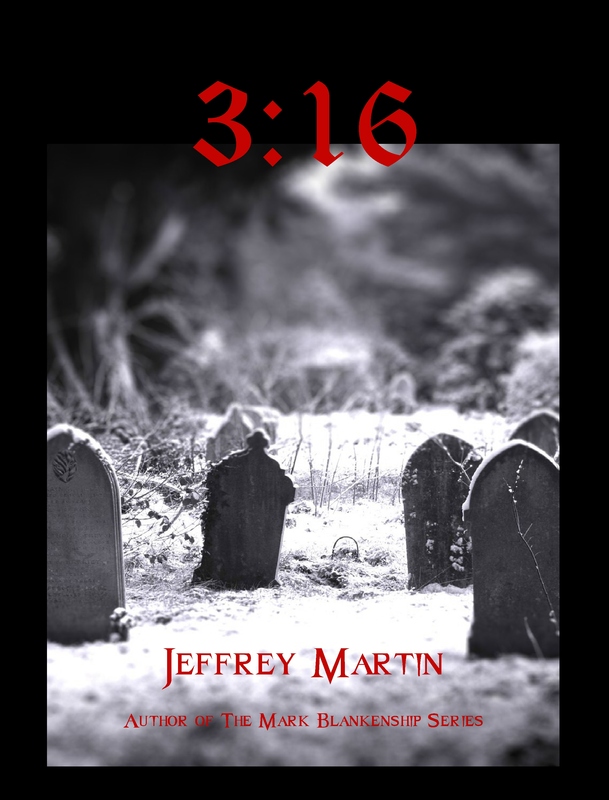 And now the moment you’ve all been waiting for…our interview with Author Jeffrey Martin. 1. In seven words or less, how would you describe your novel 3:16? Social Networking and serial killer collide! 2. What are you currently working on now? I’m working on three projects right now. The first, is a novella titled, Cupid’s Kill. 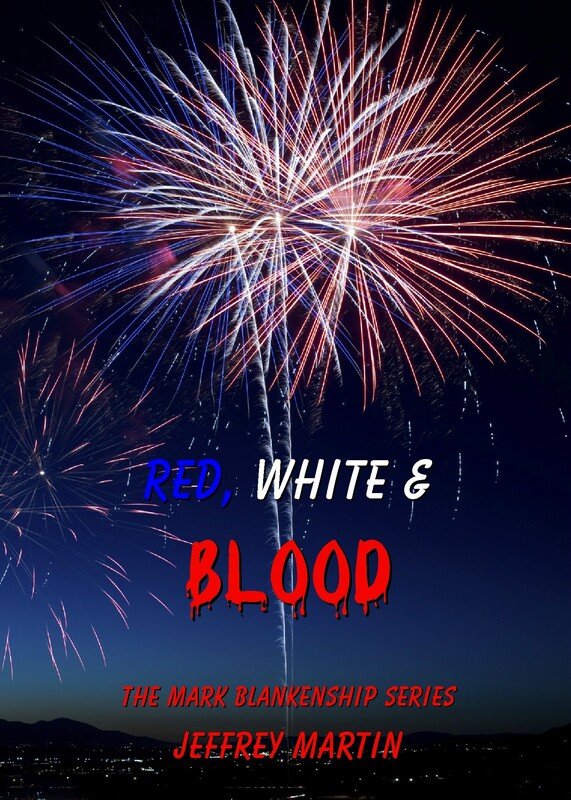 I have brought back my two protagonists from Deadly Demented, Brian Jeffers and Kelli Jordan, and this time they try to catch a serial killer who extracts the human heart of his victims, replacing it with something you won’t believe…. Hehe. The next is a digital novella, author collaboration with Giovanni Gelati titled, Forsaken. It’s about a serial killer, who leaves a unique calling card at the feet of all of his victims. A calling card written in blood! My third project is my fourth novel, Weaving Evil. A female serial killer utilizes the poisonous toxins of the Brown, Recluse, Black Widow, and many other dangerous arachnid to take revenge on her male victims. 3. Where did your draw your inspiration for your story 3:16? I watch how social networking has become the kool-aid for today’s trendy, and if you could add a serial killer utilizing it for his own personal pleasure, it would be very intriguing indeed. 4. What do you enjoy doing when you’re not writing? I spend a great deal of free time, on a rigorous physical fitness routine, and enjoy the adrenalin I get from that, to start my creative juices. 5. What writer(s) has been a big influence on you and your writing? 6. What element of your story did you enjoy writing the most and why? I enjoyed incorporating the true meaning to the 3:16 title, and creating another subplot, that really made the book what it is. 7. Do you have anything in common with your main character? I think Brian Jeffers from my first two novels, is a pretty accurate account of who I am, and what makes me tick. I put a great deal of energy into him, and it seems, most people enjoy him as a featured protagonist. 8. If you could have a paranormal power or be any type of creature, what would it be? paranormal story in mind for next year. 9. What is your favorite book that has been made into a movie? The Lovely Bones would have to be favorite. The casting for the appropriate parts were outstanding. The female lead playing Susie Salmon made the movie what it was. A very great book, turned into a wonderful heart-touching film. Today, we continue on the blog hop tour with a nice little interview from C.A. Kunz. I hope everyone is visiting the participating authors at www.angelhaze.com and I know they thank you for the support. Well, on with the interview! Carol: I am a Capricorn and was supposed to have been born on Christmas Day, but unfortunately for my mother, waited until January 2nd. I am redheaded, left-handed, and I don’t tan. I broke my neck 17 years ago, and I also have a broken titanium plate in my neck. I have two wonderful adult children who mean the world to me (one I co-write things with haha!). I reside in Central Florida with my hubby of 35 years, and three four-legged doggies. My passions are reading, and of course, writing. Adam: I am a Virgo and proud of it! I was born in New Port News, Virginia and have traveled coast to coast with my parents, living in several places due to my dad being in the military. Growing up, I was a huge fan of creature features and books about things that go bump in the night. When I’m not busy writing, I enjoy my job at a certain theme park in Orlando, Florida as a décor consultant. This job brings me face to face with all sorts of nightmarish creatures, especially when I decorate the haunted houses for the park’s annual Halloween event. My passions are writing, reading, watching movies, making props, playing videogames, and the list goes on. 2. What is your current book? Tell us a little about it? Carol and Adam: The Childe is a coming of age story with a supernatural twist, involving our main character Cat Colvin. At the onset of the story, Cat is finally allowed by her parents to join her childhood friends at Astoria High School for their freshman year, instead of having to attend snobsville Madison Prep. Almost immediately, she’s thrust into conflict stemming from an extremely viscous and caustic teacher, a strange group of preppy Goths who take an instant dislike to her, and a popular trio called the Trifecta, who for some reason wants her to be their new BFF. All of this is further complicated by the fact, unbeknownst to her, that she’s metamorphosing into the Childe. Carol and Adam: Catherine, AKA Cat, Colvin, is pretty much your typical run-of-the-mill teenager growing up in the small port town of Astoria. Sure, she’s taller than average, has a mane of fiery red hair that is impossible to tame, is left-handed, and has one eye that is sky blue and one that is amber, but that is where the differences end . . . unless you include the minor detail of her slow metamorphosis into the Childe. Cat is definitely a character that everyone would want to have as a friend. She is loyal, funny, caring, and doesn’t hesitate to stick up for others and herself. She is a very strong female character, and we tried to make her as relatable and realistic as possible. 4. What other works have you written? Carol and Adam: We both have written many short stories and poems that are for our eyes only at the moment, haha. 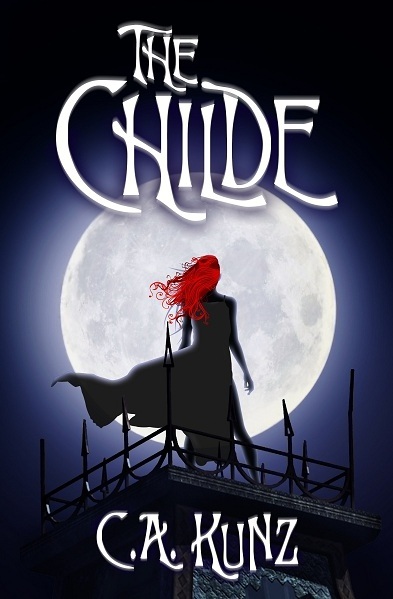 The Childe is actually our debut novel, and is the first in a planned five book series. 5. Which character do you like the most of all those you have written? Carol: I love all our characters, but I especially enjoy writing scenes with Maude Roberts. She is Cat’s nosy and annoying next-door neighbor. I think we all know someone in our lives who resembles Maude. Adam: I also love all of our characters, but if I were to just choose one, I would have to say Cat. I just love how great a friend she is to the people around her. She is a very fun character to write for too because she is snarky, funny, and quick-witted. Cat and her friends are all a blending of many of my friend’s personalities, and I just love spending time with all of them in the world we’ve created. 6. Describe your writing journey. Who are the writers that have impacted your work? Carol: Adam called me one day and said, “We’re going to write a book, mom.” I had no excuse after all, and I jumped at the chance. It has always been my dream to write a novel. All my life I have wanted to write, but then I would always think of some reason I couldn’t. The Childe took us about 9 months with lots of revisions, additions, and subtractions until we reached the point that we were ready to go to the next step. One week we spent 10 hours a day, with me on a couch, Adam sitting in a chair, in my office. Our only breaks were bathroom and eating. Thankfully my hubby Bob, who also did the wonderful illustrations in the book, fed us and even did the dishes too. What a guy!I can think of two writers who have maybe impacted my writing and they are C.S. Lewis and Bram Stoker. Adam: This truly has been one of the best experiences of my life! I wouldn’t change a thing about it! I know I am very lucky to have a mother like mine as a writing partner. She is a very positive person, and truly kept me motivated when times got rocky. There have been some truly rough patches, but we pressed on and have learned so much by doing so (and we’re still learning). Every part of this process has been a lot of fun, from the actual writing, to the publishing, and especially the promotion. My mom and I love to talk with and meet new people, and that is just what this whole experience allows us to do. In terms of who I think impacted my work, I would have to say several authors have. When I was younger, I loved almost any book about things that go bump in the night. I was addicted to the Goosebumps series and the Fear Street series by R.L. Stein. I am also a huge fan of J.K. Rowling’s Harry Potter series. This series single-handedly got me back into reading. For a while I put off books for school work, but once J.K. Rowling introduced Harry to the world, I was hooked, and school work took a back seat haha. Also, being picked to help decorate the entire Wizarding World Of Harry Potter park at Universal Studios in Orlando, FL, only further cemented my love for this series, and the impact it has had on my life and writing! 7. What do you find the most exciting thing about writing? Carol: Creating the characters personalities and their interactions with each other. Also spending more time with Adam, who lives about 40 minutes from us. Adam: Well, first would have to be going on this wonderfully exciting journey with my mom. The second would be creating not only the characters, but also the world that they live in. We’ve had a blast talking about where we see this story going and writing it all down. 8. What do you find the most frustrating thing about writing? Carol: Editing, trying to find the words to fix problems. 9. Describe your writing rituals and space? Carol: I write in the afternoon, as I am a zombie in the morning. I go into my office, our spare room, and sit at my desk. I can only work when it’s quiet, no music or distractions, as I type away. Adam:My favorite place to write is in my bedroom, on my bed, with Buffy the Vampire Slayer on in the background. I usually hand write everything and then re-type it on the computer as a way to edit myself. Many think I’m weird for doing this, but I see the hand written version as like my first draft and then when I transfer it to the computer I then have my second draft already. 10. If you could pick three words that describe you as a person, what would they be? 11. List where people can find more about you and your wonderful work. Ancraophobia- The fear of wind. Now of course, I may tweak it just a bit to accommodate the wind chime fear…so stay tuned. Until next time…remember, death is only a click away!